On the fictional island Midorijima, the shady Toue Corporation has built an exclusive district named Platinum Jail. Meanwhile, the island's poor original natives are confined to the run-down 'old-town', where warring street-gangs battle each other in the virtual-reality game Rhyme. Delivery-boy Aoba only wants a quiet life, but is soon drawn into a conspiracy when he discovers about the mysterious disappearance of numerous gang members and Rhyme players. 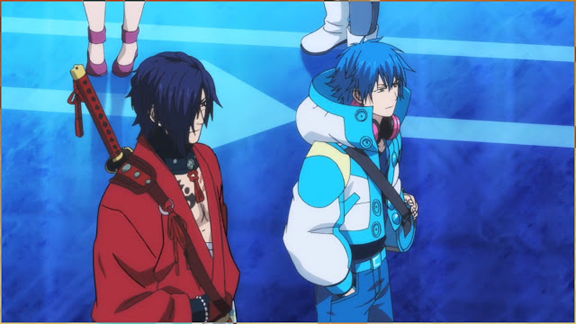 DRAMAtical Murder is a 12 part series from NAZ studio that originally aired/streamed in the Summer 2014 season. It was adapted from the Visual-Novel game of the same name and was followed up with a one-off OAV (original animation video), also included in this release. The series starts off with a fairly solid -although not exactly original sci-fi set-up. There are some neat ideas there too- particularly the concept of All-Mates- A.I. companions that take the form of talking animals. This means that Aoba is usually followed around by a lovable dog that is also a loyal friend and a powerful computer. He's also revealed to have the power to control people with only the sound of his voice- you may recognise shades of Code Geass there. Early on Aoba is forced into a Rhyme match, and it seems like this might be a big part of the series. In actual fact, this is dropped pretty quickly, and the VR concept is used only sparingly, with Rhyme only really returning at the last minute to provide the show with an easy climax. 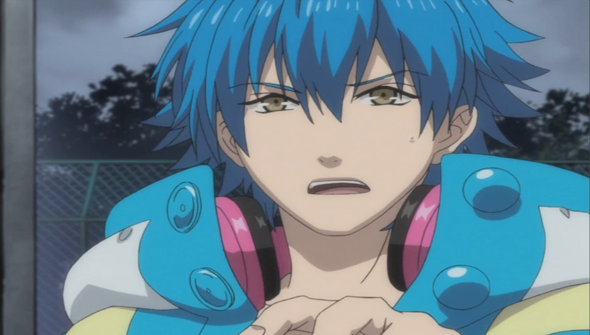 As a lead, Aoba is likeable enough, with a good heart and a determined nature, although like many of anime's "self-insert" leads, a little bland. The rest of the cast are full of characters with distinctive designs, which is paired with solid but not spectacular animation, meaning that the show generally looks pretty good. Unfortunately "a little bland" is also a good descriptor of the show as a whole. Light on action and exposition heavy, this is a languidly paced series that could have probably done the whole story more effectively in a shorter series or even a single film. It feels like a slog to the climax and, when it finally gets there, it hardly feels worth the wait and more or less just fizzes out. This is a series that ends with a whimper rather than a bang. Bizarrely, the Visual Novel game this was adapted from, was actually a part of the 'BL' (or Boy's Love) genre, which are manga, anime or games based around romantic or sexual relationships between men, aimed largely at a female audience. This is not the first time a mainstream anime was adapted from an explicit game (the successful Fate/Stay Night had similarly seedy origins). This is not apparent at all in the series itself (one entirely out-of-context smooch aside) which remains resolutely chaste throughout- although friendships in the show could possibly be read as something more. Other than that, it perhaps explains the almost total lack of female characters in the show (only Aoba's beloved grandmother gets any screentime of note). The OAV episode, however, is a different story. Using a framing device that isn't quite "it's all a dream" but might as well be, it puts Aoba in a series of encounters with the characters in the show. Here the BL elements are no longer subtext but out in the open. Presumably, this episode was intended for fans of the original game, but there is a distinctive non-consensual vibe to several of these scenes that makes it very uncomfortable- the final scene, in particular, is incredibly poorly judged. Sadly, such material is all too prevalent in Japanese fiction (more frequently involving women). The OAV adds nothing of value to the series so you won't miss anything if you skip it. 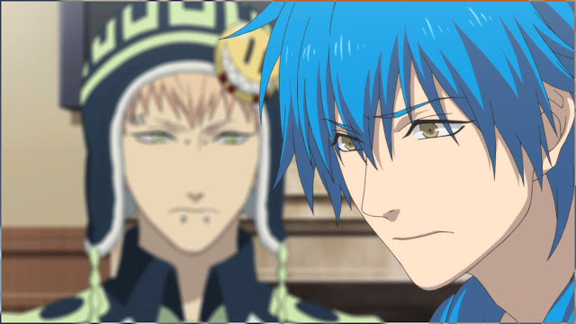 Aside from this big misstep DRAMAtical Murder is not a bad show- it's just not a particularly good one. Neither in animation, story or elsewhere does it do anything particularly new or anything that hasn't been done much better elsewhere. As such, -unless the characters really appeal to you- it's not really something that's easy to recommend to anyone. Aoba's day-job is at a junk-shop named Mediocrity- and sadly, that about sums it all up.